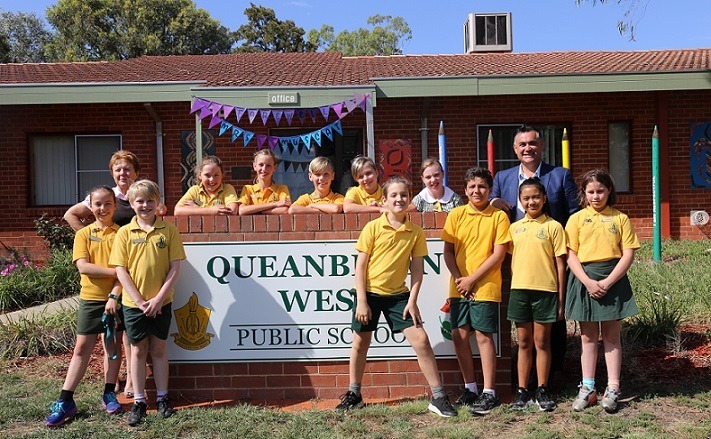 The new school year is off to a great start for Queanbeyan West Public School, with NSW Nationals Member for Monaro John Barilaro announcing a brand-new school hall. QWPS Principal Vicki Muscat and P&C President Teresa Duve joined Mr Barilaro at the school’s first assembly for the year where he committed $3 million for a much-needed, brand-new, multi-purpose hall. Mr Barilaro said today’s announcement was the perfect farewell present for QWPS Principal, Vicki Muscat, who celebrated her final day with the QWPS community as she headed for retirement. Mrs Muscat was delighted by funding and said the multi-purpose hall will hold pride of place for the staff and students and will be a place for school functions, speech nights and large scale events that are not currently possible due to limited space. The funding commitment comes after the hard work and advocacy of the P&C and wider school community, which recognised the need to provide an all-weather place for students to gather. P&C President Teresa Duve said the school community were very excited by the news. Mr Barilaro said the commitment of the Nationals in Government to education was strong, with the Government funding the construction of five new schools in the Queanbeyan-Palerang region; clearing the $449 million backlog of school maintenance projects across the state; and funding positions for 4600 additional new teachers in NSW.